Paignton Community and Sports Academy have today reported to police a fake account which initially appears to be of a teenage girl but once the account is followed, users are bombarded with indecent, sexual images. OLDWAY STRONGLY ADVISES that primary age children do not have Facebook, Instagram or other social media accounts, following the national guidance age limit of 13. We are delighted to invite parents and carers to an e-Safety event on Thursday 7th February. There are 2 sessions planned to take place during each KS2 disco. The first session will be between 5.00 and 6.00pm - the second between 6.15 and 7.15pm. Parents are invited to drop their children off at the disco and then come to class 11 for refreshments. Information on games and apps will be available and a talk from a visiting expert. This also gives parents a chance to sit down and chat and not have to rush home and back while the children enjoy the disco! There have been no specific concerns reported to school regarding Oldway pupils, but we wanted to make parents aware of concerns about children using a popular live streaming mobile app Live.me. The app allows its users to post live broadcasts and receive “tips” from other users for completing specific tasks during live broadcasts. These “tips” are in the form “gold coins”. Users then have the ability to either delete the recording of the live broadcast or post it on their profile. The app also does not have any restrictions on the age an individual needs to be to create an account. The message to reinforce with children is that anyone on the end of a live feed can capture or record a still image or video without their consent - and without their knowledge. Please monitor any app or website which your child uses which involves online chat and live streaming, ensuring that you are aware of their online friends and activity online. If you have any concerns about your child's online safety, please speak to your child's class teacher or Sam Meyer/Kate Mullen (Designated Safeguarding Leads). Recent media coverage has brought to our attention that Roblox, a lego style online game/app that a number of our children at Oldway enjoy playing at home, has a chat option which could be used by adults to inappropriately contact/build relationships with children. Please remind your children to avoid chatting to strangers online and to be careful what information they share. The internet has changed all of our lives, particularly our children’s. For parents and carers this opens up a whole new world of things to be aware of. Here are some simple ways to keep up with the things your child is doing online. 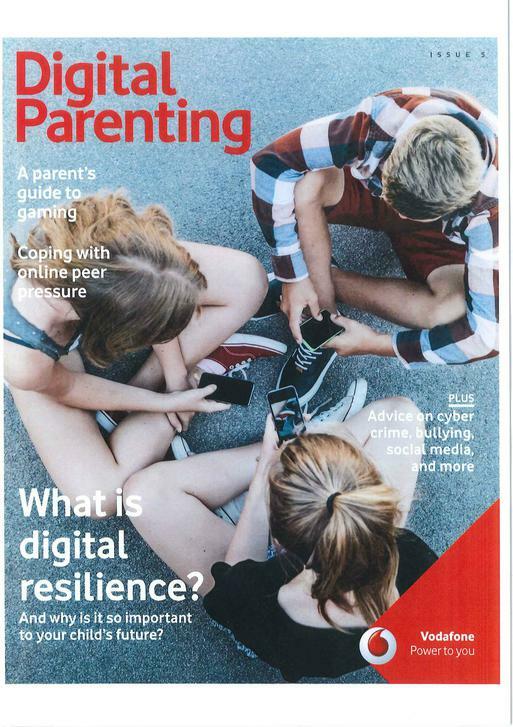 You might wonder whether what they are doing is safe, and you might also be thinking how can I be as good a parent online as I am offline? •Talk to your child about what they’re up to online. Be a part of their online life; involve the whole family and show an interest. Find out what sites they visit and what they love about them, if they know you understand they are more likely to come to you if they have any problems. •Watch Thinkuknow films and cartoons with your child. The Thinkuknow site has films, games and advice for children from 5 all the way to 16. •Encourage your child to go online and explore! There are a wealth of age-appropriate sites online for your children. Encourage them to use sites which are fun, educational and that will help them to develop online skills. •Keep up-to-date with your child’s development online. Children grow up fast and they will be growing in confidence and learning new skills daily. It’s important that as your child learns more, so do you. •Set boundaries in the online world just as you would in the real world. Think about what they might see, what they share, who they talk to and how long they spend online. It is important to discuss boundaries at a young age to develop the tools and skills children need to enjoy their time online. •Keep all equipment that connects to the internet in a family space whenever possible. For children of this age, it is important to keep internet use in family areas so you can see the sites your child is using and be there for them if they stumble across something they don’t want to see. •Know what connects to the internet and how. Nowadays even the TV connects to the internet. 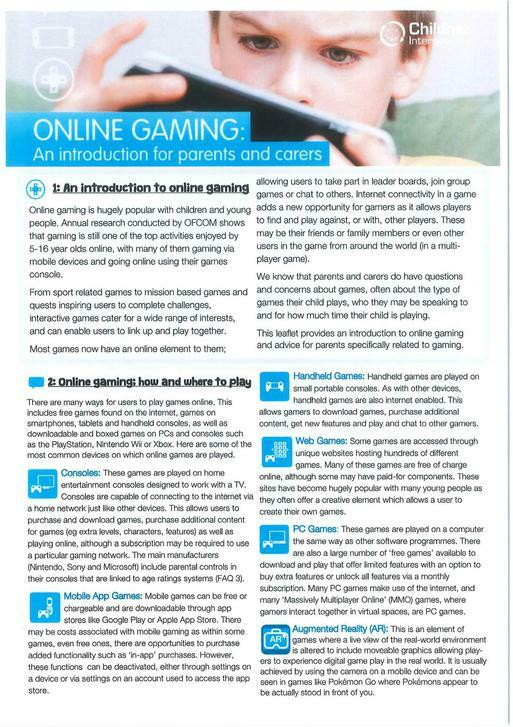 Make sure you’re aware of which devices that your child uses connect to the internet, such as their phone or games console. Also, find out how they are accessing the internet – is it your connection, or a neighbour’s wifi? This will affect whether the safety settings you set are being applied. •Use parental controls on devices that link to the internet, such as the TV, laptops, tablets, computers, games consoles and mobile phones. Parental controls are not just about locking and blocking, they are a tool to help you set appropriate boundaries as your child grows and develops. They are not the answer to your child’s online safety, but they are a good start and they are not as difficult to install as you might think. Service providers are working hard to make them simple, effective and user friendly. Find your service provider and learn how to set your controls. The Thinkuknow site provides advice on parental controls.